As my son and his girlfriend played tennis today, Tanner was unable to watch patiently from our yard across the street. Each time the ball volleyed across the net he followed it, running back and forth the length of the tennis court which is parallel to the side of our home. They could have been throwing heads of lettuce back and forth and Tanner still would have been running. It's the game he loves, not the toy. I've just realized that, despite the fact that he does have favorite fetch toys. No matter which toy we choose to play with, he'll still enjoy the game. My office overlooks the tennis court, so I was able to watch as Tanner got his exercise, sprinting from one side of the court to the other as the tennis game continued for over an hour. When the players returned--hot and sweaty--Tanner was still ready for more. That Retriever DNA just won't let him give up on the chase. I brought him inside before they finished, thinking the neighbors might wonder why my insane dog was running back and forth along our property line. He doesn't leave the yard, but not everyone knows that, so he does occasionally worry a passerby, particularly when he is sprinting left to right incessantly. Seventy pounds dogs, even the happy ones, can be scary to the dog novice. That's why we're here every day, trying to give you more tips, products and techniques to make your life with dogs more enjoyable and easier. If only I had the kind of energy Tanner possesses; perhaps I'd have educated the world by now. It's good to have inspiration! 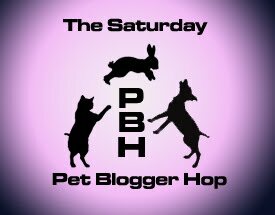 This post is part of the Saturday Pet Blogger Hop sponsored by Two Little Cavaliers, Confessions of the Plume and Life with Dogs. You can link up here or visit their sites to connect to the hop. Sounds like great fun! Tell those people who are afraid of Tanner to come meet me...I outweigh him by 30 lbs. Great way to exercise Tanner and wear him out to boot! At least he had fun! A tired dog is a good dog.